At half a centimeter long, and more agile than almost any flying animal alive, it's hard to think that this fly needs its silly bee costume. But that warning coloration is so effective that even completely harmless and difficult to catch creatures like this Toxomerus marginatus* flower fly dress in yellow and black stripes. 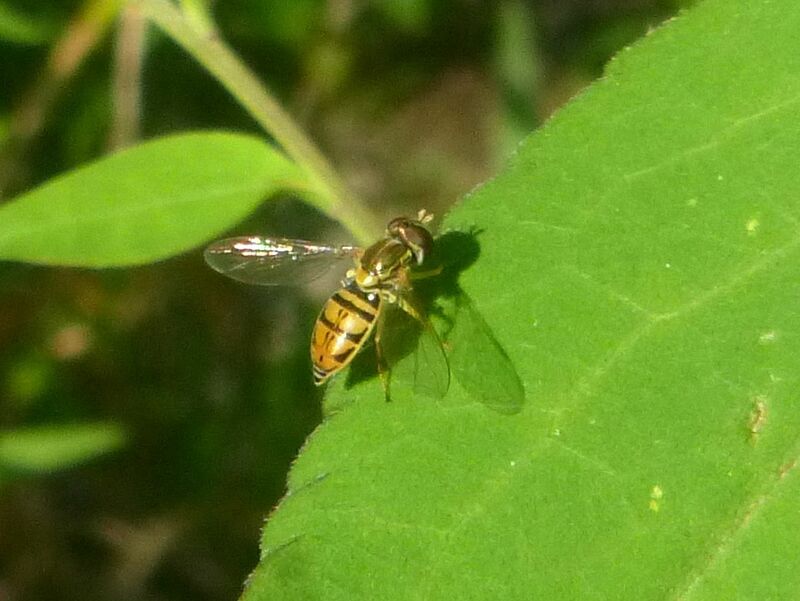 This tiny pollinator can hover (they are also called hover flies), fly in any direction including backwards, and males engage in fun territorial battles. Females lay eggs that hatch into legless monsters that roam your garden and destroy aphids. * Toxomerus, from Greek toxon 'bow' + meron 'thigh' (refers to the bow-shaped hind femur); marginatus, referring to the yellow margin on the abdomen. The disguise just causes humans to run away from them or try to swat them. But of course they can't swat them because they are such agile fliers.